I made cinnamon rolls this morning for breakfast. And they were such a treat! For some reason I don't think to make them very often. There is always coffeecake...or scones...or a muffin or two...in my freezer, so I'm not deprived when it comes to sweet treats for breakfast. Still, a sweet, yeasted baked good seems special somehow. 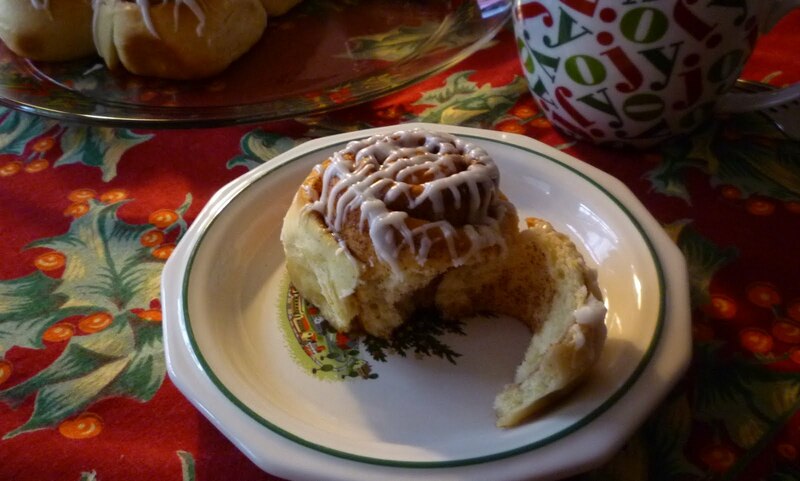 So making cinnamon rolls for Sunday breakfast...for no special reason at all...is a nice way to pamper myself. And a Sunday in the middle of the insanely busy month of December is a perfect time to do it. The recipe for these rolls uses the same basic dough that I have shared twice before—the first time in my Holiday Wreath Coffeecake...and the second in my St. Augustine Braid. Because of this I won't belabor the finer points of making and rolling out the dough again. I will only add a couple of observations that are specific to the cinnamon rolls. The first thing to note is the quantity of filling. The amount might seem a bit austere to some. I used to make them with a lot more filling, subscribing to the notion that cinnamon rolls were supposed to be super sweet and gooey. 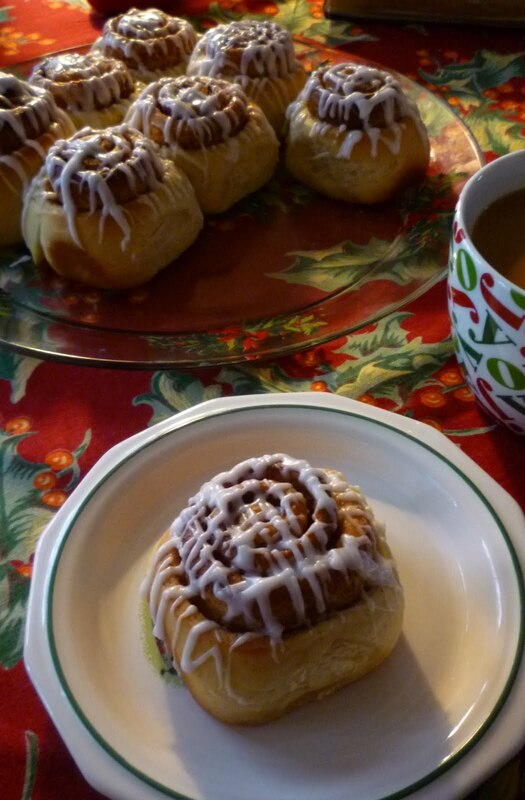 Then one day several years ago I sampled my friend Bonnie's cardamom rolls...and it forever changed my point of view. Her rolls were tender and moist...sweet and spicy...and refined. They had finesse—which to me is about the highest praise one can offer when it comes to food. 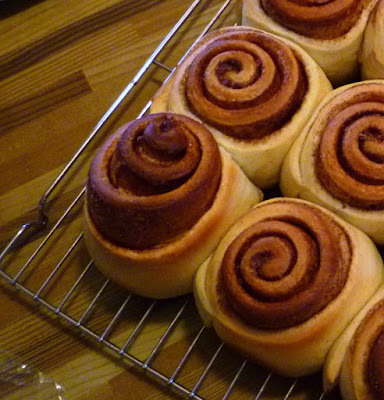 My rolls felt garish and overdone by comparison—like a caricature of what a cinnamon roll should be. The next time I made my cinnamon rolls I reduced the filling considerably. Not only were they not so tooth-shatteringly sweet in their new form, the delicious, slightly sweet dough wasn't overwhelmed by the gooey, oozing filling (which, if we're honest, usually ends up hardened and stuck to the pan anyway). I love my cinnamon rolls this way. 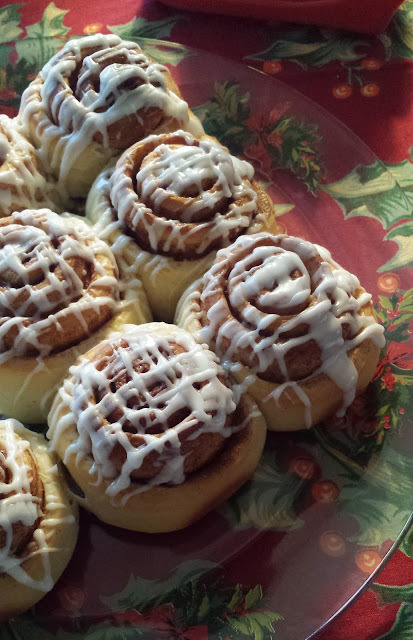 They are sufficiently sweet and cinnamon-y...and light and delicious too. 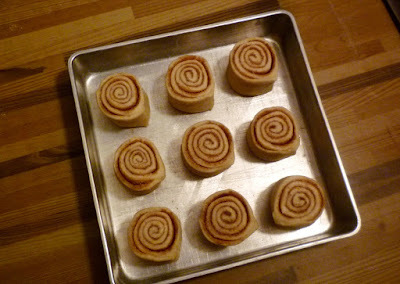 My second observation has to do with the way I roll the dough...and how I place the rolls into the pan for baking. I roll the dough thinly (into a very large square) so that I will have a nice ratio of dough to filling (you can put more filling—in a nice, thin, delicate layer—over this larger surface area of dough). It might be tempting to leave the dough thicker...but the rolls won't be quite so nice if you do. Then, after rolling the dough up you might be tempted to cut more than nine rolls (each roll will be almost 2-inches tall)...thinking that there is enough space in the pan for a larger number of shorter rolls. 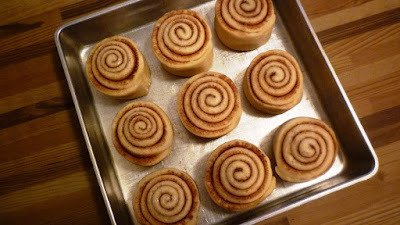 But nine tall rolls work very well—baking up into beautiful, puffy coils. The centers will sometimes escape, protruding alarmingly upwards, as the rolls bake. But if this happens, don't worry—they will settle back down when the rolls come out of the oven. 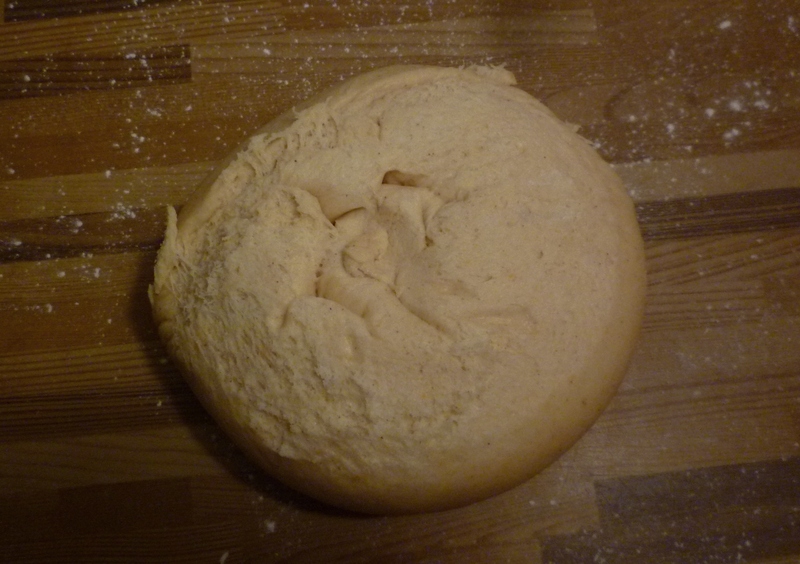 I have given directions for making the dough, and then forming and baking the rolls, on the same day. And you can of course do it this way if you like. But I have also included instructions on how to make the dough the night before and then finish them the next morning...and it is my preference to do it this way. If I had to get out of bed and make the dough, I would probably never have cinnamon rolls on a Sunday morning. 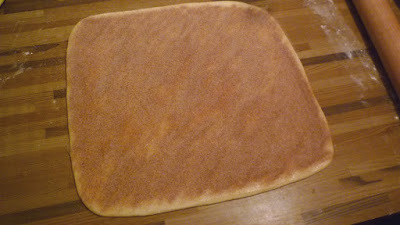 But even on Saturday nights when I am very tired, I don’t find it that difficult to make the dough. I then have the time it takes for the first rise to wind down a little from the day (and the week) with some other activity. It is then an easy thing to get up at my leisure, roll and form the rolls, and then move slowly into my Sunday while they rise and then bake. 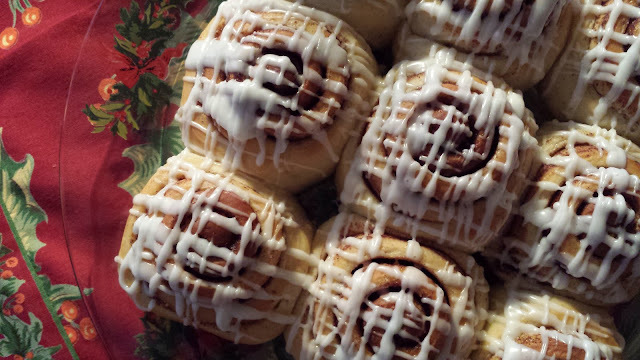 In no time at all the house is filled with the aroma of cinnamon, sugar and freshly baked rolls....and my day (and week) is off to a pretty fine start. Place the water in a large bowl and add the yeast. While the yeast is proofing, scald the milk. Remove the milk from the heat and add the butter. When the butter is melted, add the sugar, salt and orange zest. If the milk sugar mixture is hotter than lukewarm, let it cool briefly before proceeding. Add the warm milk/sugar mixture to the proofed yeast and whisk to combine. Whisk in the egg. Add 1 c. of the flour along with the cinnamon and beat until smooth. Gradually stir in enough of the remaining flour to form a soft dough. Turn the dough out onto a lightly floured surface and knead until smooth and elastic (5 to 10 minutes). Place the dough in a buttered bowl. Turn the dough to coat with butter and cover the bowl with plastic wrap. 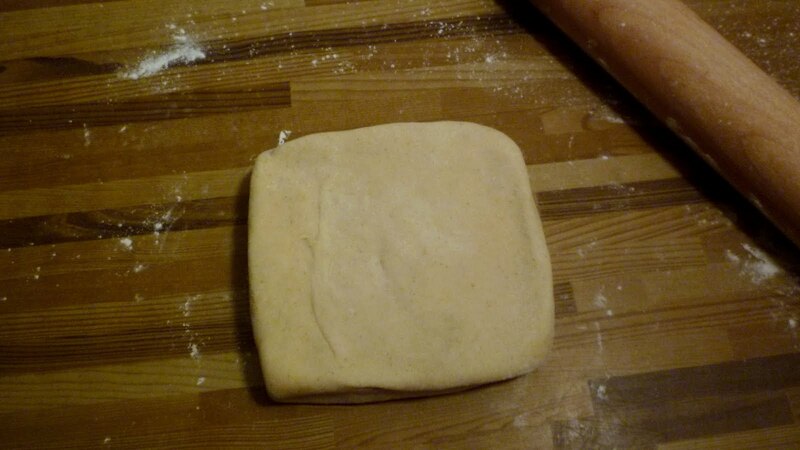 Let the dough rise until doubled in bulk (about 1 ½ to 2 hours). Roll the dough out to a large thin square (about 15- by 15-inches). Brush the dough with the melted butter. In a small bowl, combine the sugar and cinnamon. Evenly scatter the cinnamon-sugar mixture over the buttered dough. 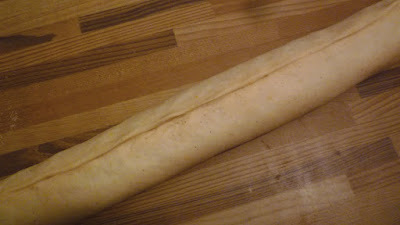 Starting with the edge nearest you, roll the dough up jellyroll-style (don't stretch the dough as you roll...or roll too tightly). Pinch the seam to seal. 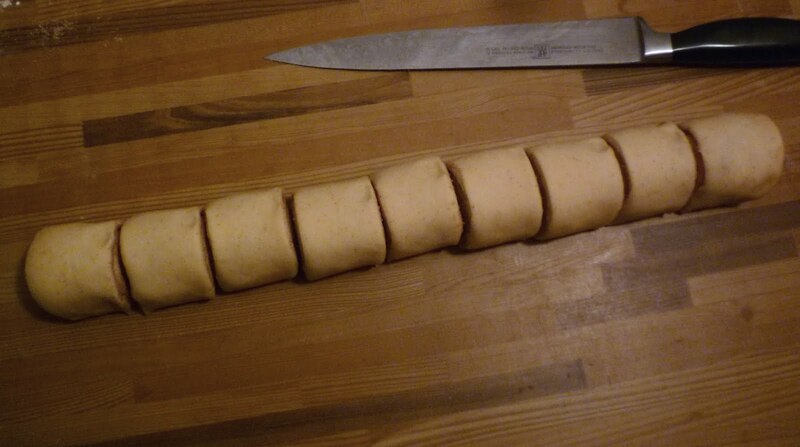 Using a sharp knife, slice the log into 9 rolls. Place the rolls in a buttered 9-inch square baking pan. Bake the rolls at 375° until puffed and golden brown—about 20 minutes (an instant read thermometer will read about 180° to 190°). Remove from the oven and let cool for a few minutes. Remove the rolls from the pan and drizzle with powdered sugar icing (recipe below) and serve immediately. Powdered Sugar Icing: Mix 2/3 c. powdered sugar with enough milk (about 3 to 4 t.) to form a thick glaze—it should drizzle slowly from a spoon. 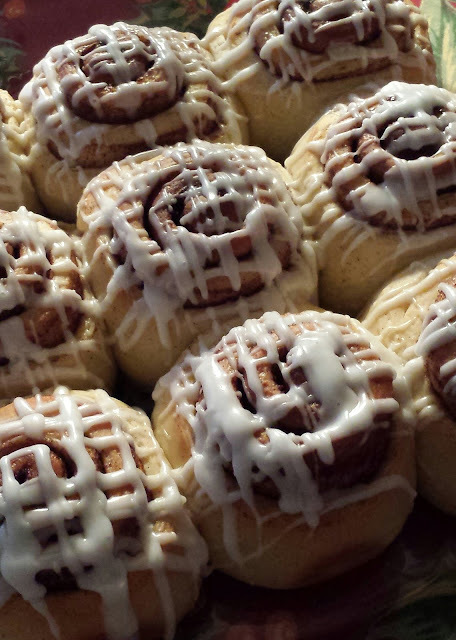 The orange zest sounds divine in Cinnamon Rolls. I've not had one with orange. Is there a way to freeze the dough or baked rolls in advance for a few days? I am traveling several hours by car and think it would be fun to take a tray of Cinnamon Rolls for everyone to take home as a departure gift. I am wondering how to make the rolls more transportable. Thanks you so much for your blog and the education you offer to us!!! Hi Deb, Yes, these rolls freeze very well in their baked form. You can freeze the dough too, but I find it to be more work to deal with thawing and using the thawed dough than just making them and freezing them. I always freeze the rolls we don't eat the day I make them so I can have "fresh" cinnamon rolls during the week or two following. You can freeze them with or without the frosting. Just wrap the cooled rolls (all together in their pan configuration...or individually) in a double layer of plastic wrap (or single and then tucked into freezer bags). You can thaw them--still wrapped so they won't dry out--by letting them sit out at room temperature. When thawed, cover them loosely--so the frosting drizzle won't smear--with foil and warm them briefly in the oven. Or, remove the plastic wrap from the frozen rolls, wrap them in foil (I usually butter the foil), sealing it well, and pop them in a low oven (325 to 350) until they are thawed (20 to 30 minutes). If you do it this latter way, sort of "tent" the foil so the frosting won't stick to it. 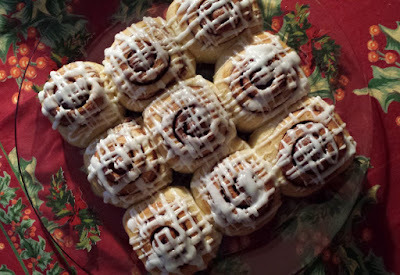 You can also freeze them unfrosted and then make the frosting while they thaw and drizzle it over the warm rolls. I love the orange too...but it is very subtle. If you really want to bump up the orange flavor, you might consider adding orange juice...and zest...to your powdered sugar glaze instead of milk. Than you for letting me know you enjoy my blog! Enjoy the rolls and have a wonderful holiday! "If the milk sugar mixture is hotter than lukewarm, let it cook briefly before proceeding." Is "...cook..." in that sentence from your directions a typo for "cool"? Or am I missing something? Regardless, this looks like a great recipe. I am definitely going to try making this the next time we have a family brunch get together. Hope you and yours have a great New Year ahead! Yes! It's a typo! It should be "cool"... Thank you so much for letting me know...I really appreciate it. And I hope you enjoy the cinnamon rolls. Happy New Year! Glad to help. As my girlfriend once pointed out to me: the hardest thing to proof read is one's own work. Because you know exactly what you meant to write so that is what you tend to see on the page. Except when that is not...quite...what one actually wrote.